This week we're back with more new products and another demo project. By now, you've probably heard about the horribly tragic events that took place in Aurora, Colo. (about 30 miles southeast of here) early this morning. This cowardly act has certainly shaken our state to its core. It is difficult to wrap one's head around such a senseless act and our hearts go out to all the victims and their families. Please keep them in your thoughts. We're going to try to continue with business as usual (so to speak) which means another Friday New Product Post. This week we have two videos. Not only did we do a video showing some of the products (as well as a demo), but we also decided to 'stress-test' the enclosures. As I stated in the video, we conducted a rigorous and oh-so-scientific durability test on the aluminum enclosures. They held up quite well. Check out our findings. All I have to say is, we've done stranger projects. Virtual curling was one of those odd ideas that we just had to see where it went. It turned out to be pretty fun, but ridiculous at the same time. But in the end, we ultimately made a hovercraft, so that's gotta count for something! Once you get a project done, nothing makes it look complete like an enclosure. 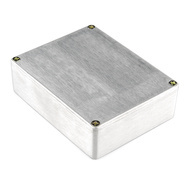 If you need something durable, you might want to check out our new aluminum die-cast enclosures. They come in two sizes and have a rough, unfinished exterior. They look like they mean business. You can dress them up with some paint or sandpaper, it's up to you. They feel very solid and from the video above, we've proven that they will stand up to just about anything. Blowers are great for inflating costumes, whacky advertising aids, hovercraft, or anything else that needs a good blast of air. 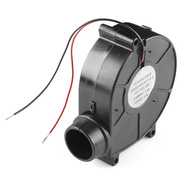 This blower operates at a wide voltage range. We found it provides a nice gentle breeze at 5V and ramps up to a pretty impressive force at 16V. It's rated at 12V, but we found it to be pretty powerful a bit beyond that. Remember our clear breadboard? Well, we now have it in translucent red as well. It's the same breadboard, but now with a snazzier color. Some people were complaining that the clear one was hard to use because you couldn't easily see which row you were using because it all blended together. The red should help with that. 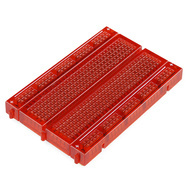 We have a new LilyPad Battery Holder. This one includes a simple on/off switch. Now you don't need to use the battery as your on/off switch. It holds a 20mm coin cell battery and has tabs on the outside for sewing or soldering. 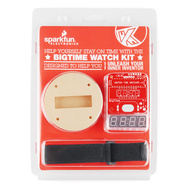 The BigTime Watch hits the retail shelves today. It comes with everything that the non-retail version comes with, but now in fancy packaging. Build your own wristwatch complete with Arduino Bootloader, see-through case, and 7-segment display! 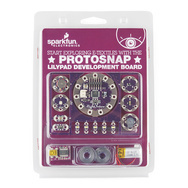 Additionally, the ProtoSnap LilyPad Development Board makes its way into retail packaging. With the retail package, you get the main LilyPad Development board, a LilyPad FTDI, a battery, some conductive thread and some needles. This kit includes everything you need to get started with your e-textiles project. Although this may look like a standard LED, it's a bit different. 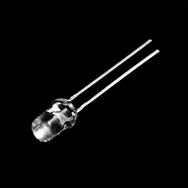 This 5mm red LED is actually used for optical sensors, like those found in optical mice. We used these in our retired Mouse Sensor Evaluation Board. With it retired, we no longer need these in production so get them while they last! 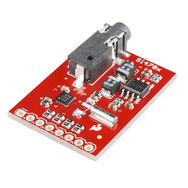 We also have a new revision of the Si4703 FM Tuner Evaluation board. This new board sports a different layout, SMD headphone jack, and some other minor design tweaks. 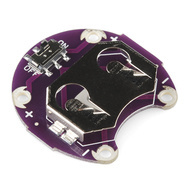 If you aren't into the full evaluation board, you can also check out the simpler breakout board. 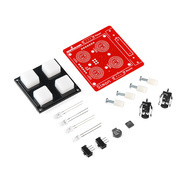 Lastly, we have a new version of our Simon Say Surface Mount Kit. The kit remains ultimately the same, but we went through and made the entire thing a bit easier to build. We've increased pads, moved things around, and added traces so you can still use your LED even if it got soldered in backwards. Well, that does it for this week. Hopefully there's a product you find useful here. Thanks for reading and watching and I'll see you again next week with more new products. I always wish these videos had more footage of the project. (When there is one.) You guys clearly spend a lot of effort putting them together, I'd like to see more than the thirty second highlight reel. In the wake of a tragedy like this it's always hard to find the right words, something that will be uplifting and encouraging without being pithy and dismissive. I hope the Sparkfun family is safe. You guys are more than just an electronics company to a lot of us, and I wish you the best as you find your way through all this. If I had a beer, I'd drink it in your honor. I'm at work though, so coffee will have to do. LOVE the curling hovercraft! You guys do know how to brighten up a Friday, don't you? Hmm... they probably didn't have time to do hover curling stones as well. However, they could easily be done. Add a few brooms and then you'd have a "floor curling" set! That hoovercraft gave me a great idea. Could you tell me what battery and voltage did you used to power the blower and about how long the battery lasted. Thank you... keep doind those great demos. BTW I agree with AndyL, it would be nice if you could add some more info and pictures of your demos. Is the AVC recap still in works? Sure is. Check back Monday! ps, the shirtless rednecks in the back were a nice touch though..
Not sure whose manly laugh that was at the end there... But overall great videos. I hope all of SparkFun (including family) is safe and sound. Whoever comes up with the names for the demos deserves a personal beer keg. Maybe you should have a page with the acronyms and photos on it just for giggles. That's me. Everyone else groans, but it's a fun side-project, coming up with the acronyms. It looks like one of your cameras has a couple pixels out. I was certainly saddened to hear the news today and forgot that you, Sparkfun, were located close to that area. Keep your chin up - we are all thinking about you and wishing you the best. 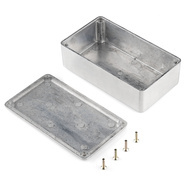 Cool part is using Aluminum means you can use the enclosure as part of your heat sink. I've used these enclosures before, and are pretty easy to Dremel into. Just wear a long sleeve sure to avoid the little metal bits from flying into bare skin.